George Carlin has a great rant about golf, paraphrasing and skipping the enjoyable expletives, he said golf is an arrogant game taking up too much prime real estate for one little ball. I promise that I won’t extend the metaphor too far, but I want to ask folks to consider how much real estate they really need to do whatever it is they think they need to do in churches. Most church property sits idle for most of the week. I’m just asking: does that make sense? This has led me to another thought, and that is to consider why people go to church. It may seem obvious to some people, but it is no longer obvious to me. For Christianity, this is Holy Week, the most significant week of the church year. Many Christians believe in making some sacrifice for the Lenten season which precedes Easter Sunday. I gave up church committees for Lent. It has been my best Lent ever. The Pew Forum on Religion and Public Life released a study October 9, 2012 called, “‘Nones’ on the Rise: One-in-five Adults have no religious affiliation.” (The online link follows.) “Nones” is the category used by Pew and others to describe those with no affiliation to organized religion. The category includes atheists, agnostics, those who describe themselves as ‘spiritual but not religious,’ and just ‘none’ in general. While most organized religions in America have been in decline, this is one category that has been “on the rise.” The Pew study reported an increase from 15 percent to 20 percent in just five years, with a current total of 46 million adults. Duke religion scholar Mark Chaves has provided a great deal more depth and analysis in his new book American Religion: Contemporary Trends (2011 Princeton University Press). If you want to read just one book about what’s really going on with religious trends in this country read this one. Chaves showed that the trends in American religion are more generational than year-to-year (p.50). In this context and citing two surveys, Chaves said that the changes in religious organizations reflect the changing demographics of society. Demographics are their own story and I’m not going to tackle that here, except to share Chaves’ observation that the decline in religious involvement is the same as the overall decline in civic involvement and volunteerism in America (Chaves, Congregations in America, p.29). Chaves’ primary measure for religious participation was attending services at any religious organization. In 1965 it was 40 percent of Americans (not adjusted for people saying they go more than they do) and in 1993 it was 27 percent (p.44). The current rate is 25 percent, which is still “high by world standards.” The median number of Christians at worship weekly is less than 100 (p.61). This takes me back to George Carlin and real estate. How much building do you need for 75 people a week? I have a friend who is a New Englander who told me that the two small, struggling Lutheran churches in his home town can’t combine because one is German and one is Swedish. They have no difference in doctrine or practice, they just come from a different heritage. This is no disrespect to Lutherans because I have all confidence I can find you a similar example with no difficulty whatsoever in any (using Chaves’ description p.52) “conventional mainstream American religion.” Yet while religious practice and participation has been declining, the belief in God has not declined at the same rate. It was 99 percent in the 1950s and 92 percent in 2008 (p.11). I participate in a Christian service with some regularity. I find myself looking around and wondering why folks are there. What is it that keeps them coming? There are those who would tell you that God expects or even requires them to participate regularly in some religious service or ritual. Well, good for them. First of all, I am skeptical of anyone who says God has spoken to them. Very many weird and bad things have happened by people spouting that line. Even so, the question remains: why is it that so many people who believe in God are not inclined to act on that belief by going to a service? I want to suggest several issues for which I don’t have statistical evidence. First of all, it doesn’t seem churches have clarity of mission. (By mission, I mean organizational priority, not as in “missionary’ or proselytizing.) Second, churches are greedy with their real estate. I don’t see how they need all those buildings. 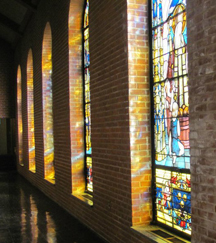 I do like a pretty church and I love stained glass, but it takes a lot of resources to support that property. Third, many churches function as social clubs and carry with them the same dysfunction of any group of human beings, as well as the inevitability of committees. It could be that the church is dying, certainly that is true for some congregations. Maybe it’s not on life support, but in some cases, groups are struggling for survival and their real estate hasn’t adjusted to their reality. Maybe it’s like the post-dot-com stock market changes. It’s painful at first, but it’s just a correction and now we just have realign our attitude and assets accordingly. Here’s my mission: 30 churches in 50 weeks. I’m going to start with an ever-expanding circle from my home in suburban Philadelphia and just be the visitor to see if I can figure out why people are there. Feel free to write me – here or at my e-mail address on the contact page. Why do you go to church? Why don’t you go to church? It’s Easter this week for Christians, so I’ll start with my home church, and I’m going to count last week when I checked out the Presbyterians. Before I go, let me add that I really miss George Carlin. Maybe the world needs more George Carlins and fewer churches. -J.B.